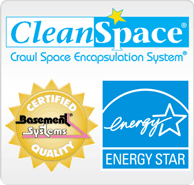 Contact Mountain Crawl Space, Inc. to request a free quote. Our crawl space sealing and insulating treatments improve home comfort and energy efficiency during the winter and all year round. Fiberglass insulation installed in the crawl space ceiling will not protect you from frozen pipes, cold floors and high heating bills. Ductwork in a vented crawl space is another problem. Outside air and temperatures make your ducts cold in the winter and hot during the summer. This forces your HVAC system to work overtime to deliver air at the proper temperature, cutting system efficiency by as much as 25-40 percent. General contractors and home repair professionals can’t transform your crawl space like we can. We specialize in crawl space repair. Our innovative products aren’t available to other contractors. Our system provides complete sealing, insulation and moisture control. Call us or visit our Free Estimate page to schedule an inspection and quote for crawl space winterization. We provide a wide range of crawl space repair solutions to homeowners in Clifton, Montrose, Grand Junction and many areas of Colorado.